This is an amplification to a point made to irishsultan in the comments to Monty de Sade. 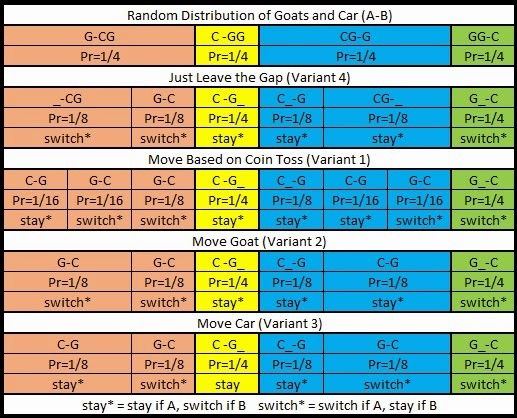 Variants 2 and 4 are the same with respect to the switches and stays, you just win a goat as well as a car if you get it right and you get nothing if you get it wrong. Note that the options each of the move variants are based on the distribution illustrated in the "Just Leave the Gap" variant. irishsultan seemed concerned about the placements of the goats. The image below relates to a slightly different variation of Monty de Sade in which we do care about the names of the goats, so a grouping of Mary with the car is distinct from a grouping with Ava with the car. The result is still a likelihood of 1/2 of winning by switching or staying..
Are you forcing the distributions G-CG and C-GG to be equally likely? Because normally I'd expect the former case to be twice as likely. Especially when the contestant still can see three doors. If you look at Monty de Sade, you should see that I wrote the options down as A – G / B – CG, A – GG / B – C, A – CG / B – G and A – C / B – GG. Note that I said that we didn't care about the names of the goats, the car is either by itself in a group or it is grouped with one of the goats (and we don't care which). It's possible that the producer simply selects one of the four options at random and then slots the goats around the car as necessary. I agree though that if the producer did something more fancy, like a two step process with assignment of car to A or B at random, assignment of first goat to A or B at random and then assignment of second goat either at random or as required to fill the gap, then you will have a different distribution but in this case G-CG will be three times as likely as C-GG. If the producer picked a door at random, before tossing a coin to decide if it was A or B, then yes, G-CG would be twice as likely as C-GG. Another possible selection routine is to pick a car or one of the goats at random, put it in A or B at random, select between the two remaining at random, put it in A or B at random, then either fill the empty group or put the last one in A or B at random - in which case the result is such that C-GG is half as likely as G-CG. The point, of course, is that I didn't specify beyond saying there were four options. I've updated the article to include an image of the probability tree for a scenario in which the goats' names matter. We can say that the groups are selected by choosing from the three options at random, then choosing whether it is A or B at random, leaving the other two as being the other group. It's conceivable to go into more detail to address which specific doors they are behind, but the contestant has no clue of this when she decides between options A and B, and even when the goat is revealed, she has no clue as to whether the goat was in group A or group B - and the complexity required to illustrate all the configurations gets a little unmanageable. I really don't think it makes a difference though. It'll still end up as a 50-50. My point is that even with goats indistinguishable the doors are not, I was thinking the participant could gain information somehow by the assymetry there if the host wasn't careful. I'm no longer sure that's the case (and I always thought that this could be prevented by a careful host, I just saw no reason why the host would go to that extra effort when it could distribute the goat randomly amongst the doors and then randomly choose a single door and then randomly choose which choice has the two doors). Don't forget that the contestant doesn't know what the groups A and B mean. She doesn't know whether she's selected one goat, or two goats, or a goat and a car. And she doesn't know which doors correspond to her selected group. That said, it would be interesting to know what minimum information is required to create a useful asymmetry for the contestant. What if the host announced which group the revealed goat belonged to? Would a specific variant of the game provide more useful information to the contestant in this instance? Would it make a difference if the goat was identified? How could the host be insufficiently careful and (possibly) provide information, if we were to modify the game very slightly in some way? I think it is possible that some information could be gleaned if the host announced the group that the revealed goat belonged to, but only if the host had been restricted to selecting a goat from a group that would not be emptied by the removal of a goat. But I think that that effectively tells the contestant whether she is playing a Monty Hall game or a Reverse Monty Hall game. What do you think?